Teresa was a sole-support Mom raising 3 kids when she started to accept commissioned portrait work that had to be slotted into random time spots between retail and bartending jobs. In 1997 she took the big risk known to many artists by giving up the waged work to commit to art. It was a good risk. She’s never looked back. Teresa is not afraid of strong colours which she uses effectively to convey the joy of discovery that she finds in life. Oil is her preferred medium. 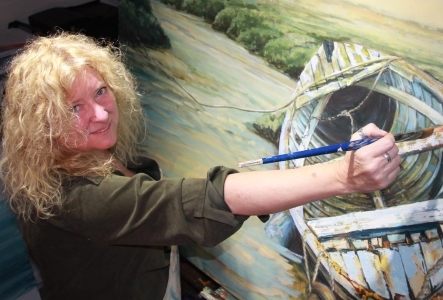 Teresa also produces scenic art for live theatre – Drayton Entertainment, for example. Another example: if you’ve ever attended a Stuart McLean “Vinyl Café” show, that backdrop you were looking at was her work. Teresa travels extensively with her husband Peter and she has the photographs to prove it. She aims to produce a series of works based on African subjects and themes. This will be a challenge to time spent with 6 beautiful grandchildren.